Confidently perform general surgeries and complex vascular procedures with the Philips BV Endura C-Arm. 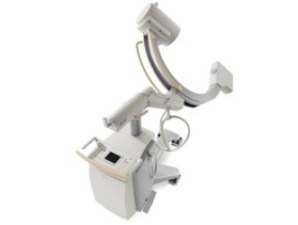 This versatile c-arm system enables quick positioning, easy patient access, and exceptional image quality, all of which enhance the accuracy of procedures, confidence, and decision-making.The addition of vascular functionality comes from this system’s c-arm rotation of 135-degress as well as its 12-inch image intensifier. The BV Endura c-arm also has SmartVision, a set of advanced imaging technologies, that serves to provide the highest quality images at the lowest possible radiation dose. Furthermore, this system has 1k x 1k resolution, advanced noise reduction, 2D edge enhancement, BodySmart, and automatic contrast and brightness adjustments. When taking images, they may be viewed on the system’s dual monitors. Thanks to its compact size, the BV Endura c-arm can easily move from room to room, around tight spaces, and as close to the operating table as possible.